Certified Professional Interpretive Planner Certificate. 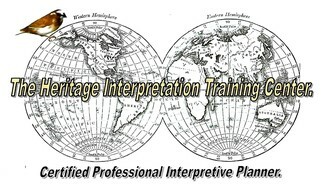 While other organizations offer certified interpretive planner or related certificates, our Certified Professional Interpretive Planner Certificate is far more content extensive, university level, and more in-depth than any of the other interpretive certificates. It offers more current content, hands-on learning experiences, and direct content with the Certificate Manager/Trainer and Coach throughout your Certification experience. - Taught and coached by professional interpretive planners with 40 years of actual interpretive planning experience, as well as years of teaching interpretive master planning courses. 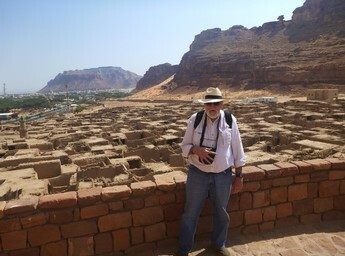 This includes developing and teaching a course on interpretive master planning at the Ohio State University and teaching introductory and advanced courses in heritage interpretation at Michigan State University. - Based on a University Course Outline system consisting of completing nine (9) actual courses in interpretation, not just taking one course, one test and mainly paying the course fee. The Certificate courses are offered in content sequence leading up to the final course in developing your interpretive master plan. - Awards CEU (Continuing Education Unit credits for the Certificate Program (and each individual course that is offered as part of the Certificate Program. (Interpretive planning in Saudi Arabia, 2017). Community Interpretive Planning Training, Columbia, SA (right). Introduction to Heritage Interpretation Course. 14 Units - 2 CEU credits. A review of interpretive basics in case you never had a college level course in interpretive principles, practices or theory. Interpretive Writing e-LIVE Course - 8 Units and 2 CEU Credits - Interpretive planners do lots of writing, not only the interpretive plan itself, but writing for interpretive panels, exhibits, brochures or other interpretive media. The Interpretive Exhibit Planners Tool Box e-LIVE course - 11 Units and 2 CEU Credits. Exhibits are very expensive, and if you're going to recommend them in your interpretive plan you better know how to theme them, plan them, and cost them out. Do you know how to write a RFP for visitor center exhibits? Interpretive planners must! Planning Interpretive Trails e-LIVE Course - 13 Units - 2.5 CEU Credits. Interpretive trails are a basic for any interpretive plan for parks, natural areas and related outside interpretation. Do you know the best trail materials, lengths, maintenance needs, trail standards for construction, etc. An interpretive planner has to be up on all this. An Interpretive Researchers Guide for Developing Visitor Surveys and Questionnaire/Interview Designs For Natural & Cultural Heritage Sites and Attractions. Ten Units - 2.5 CEU Credits. A key part of interpretive planning is an in-depth understand of the sites visitors, visitor seasonal use and use patterns, visitor interests, age groups, market groups, etc. You are not planning the for the park/site staff, you are planning for the park/site visitors. Have you ever had any training in this element of interpretive planning? Innovative Strategies in Interpretive Media and Services Planning - New Conceptual Tools for Today's Interpretive Planners. Markets on One, Mass Customization, Experiential Planning and the Psychology of Visitor - Interpretive Program Topic/Mode Preferences. If you're not using these in your interpretive media/services planning and development then you're way behind the creativity curve and could be losing new visitors as well. Welcome to the new millennium for interpretive planners where "one size does NOT fit all". Eleven Units, 3 CEU Credits. 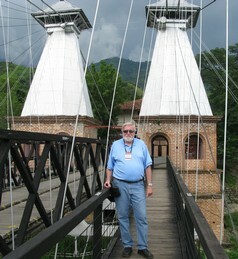 Interpretive Master Planning - e-LIVE. 13 Units, 3 CEU Credits. As the Interpretive Master Planning course is the "capstone" course where all of the previous concepts are pulled together to form your interpretive master plan, you may chose this main course. The "final exam" for the Certified Professional Interpretive Planner certificate is you submitting a working draft of an interpretive master plan you have been working on. Products speak louder than words. You can also submit a recently completed interpretive plan your done with a "critique" of the plan, what you think you did well, what you now know you coud improve on do do differently. While there is a recommended sequencing of courses, just as with any university degree program, from introductory to more advanced courses, depending on your own background and training/experience, you are allowed to undertake more than one course at a time. It is estimated that the average time needed to complete all the required courses, would be approximately 10 months. All the individual courses are "work at on your own pace" and as fast or as slow as you need to. - A cover letter listing all the courses you have completed as part of the Certification program. Note- the tuition cost includes eight (8) individual interpretive courses, One-on-One interaction and coaching with the Certificate Manager/coach. All text books and reference materials, and individual consultation on your interpretive planning project as needed. Two seperate payments of $750.00 each. You can start the course as soon as the certification payment is received. Prior to starting the course you are encouraged to chat with the course manager, John Veverka, to provide academic advising for you on the courses and course sequences, or answer any questions you may have.